Semiconductor Stock Market Canaries: Chirp, Warble… Soon a Croak and Silence? The canary is no longer chirping in a healthy manner and the economy’s coal mine has a toxic gas leak. 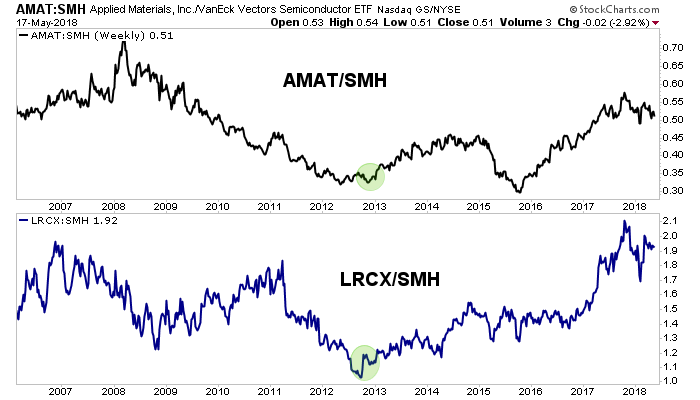 While the recent Lam Research (LRCX) earnings report was pretty good and there were positive aspects to that of Applied Materials (AMAT), these highly cyclical companies that have been at the front end of the entire economic cycle that had its beginnings in 2013 are showing signs of wear. Business is still good but when you are talking about cyclical leaders, it is growth rate that matters. 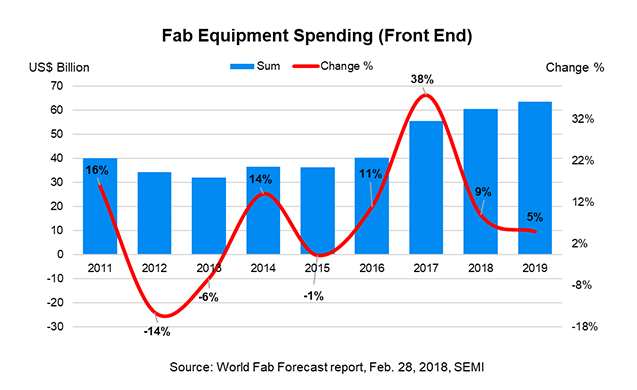 I have read article after article touting strong current business and future drivers that will change the typical Semiconductor cycle as next generation Fabs are needed for ever more dynamic specialty chips for higher-end devices. 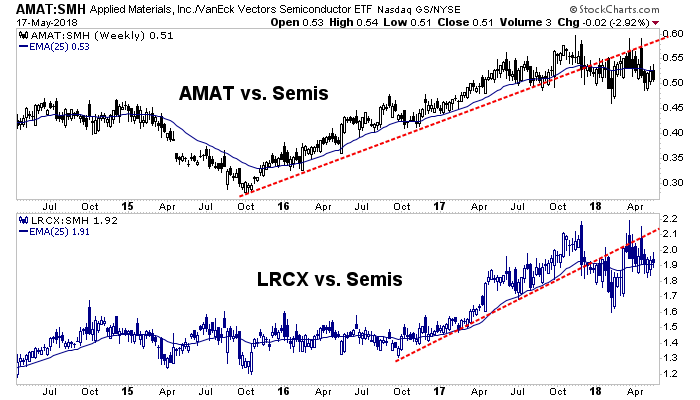 Taking the pulse of the analyst community, from the large houses to the boutiques to the chattering blogosphere, the theme seems to be that a buying opportunity is developing for the likes of AMAT and LRCX, two excellent companies. If you take Applied CEO Gary Dickerson’s view at face value, a decline in these stocks would be exactly that, an opportunity. But as someone from the real world (as opposed to the Armani wearing analyst community) I can tell you that these companies have no better visibility than you or I. How can they? The global macro economy is subject to many inputs and if future outcomes were that easy to read, we’d all be rich beyond our wildest dreams because we’d have already seen around every corner. The global economy, while healthy now is not immune to the business cycle. So here is a corner to look around. In NFTRH we began using this chart in Q4 2017 after a major financial media outlet published an article touting these two companies as great values for great investment returns in 2018. Leadership by the Semi Equipment companies has flattened out. Okay, I know it’s simple but when confronted with legions of analytical entities with firmed up views (like a buying opportunity in Semi Equipment) it pays to at least consider that when we became constructive on not only the Semi sector but looking forward, the economy as well, it was not canaries we were hearing; it was crickets! As in ‘cue the crickets’ in the economic analytical community. That was the response when we claimed a positive cycle was at hand. Now? Your favorite buttoned down analyst and/or your favorite financial blogger may be on the opposite side and an article like the one you are reading right now is definitely in the minority. I expect the response to be largely ‘cue the crickets!’. This chart dials out to the late 2012 low and new cycle leadership by the two major Semi Equipment companies over the general sector. Each ratio is currently in a nasty looking pattern that is not likely to be improved after today’s market activity. At this point I want to give proof that I am not just some bear waiting interminably to finally give you the big “I told you so!” a few years after establishing a bias. And then there was the disturbance in 2015-2016, in which we kept NFTRH subscribers on course with the correct – as opposed to media instigated – view of a still-positive macro backdrop. It is vital to show your work, just as you had to do in grade school. Otherwise you are just spewing opinions, stirring emotions and/or confirming peoples’ bias. I don’t go negative unless given reason, with a great example being a timely post on the over-hyped 3D Printing mania that the Armani suits were shoving down peoples’ throats. Shortly after it was written, at the height of the promotion and ridiculous valuation, the sector imploded. One SeekingAlpha article recently cited Semiconductor industry experts as a guide to a bullish view on the industry. Lest you think I am grabbing data out of thin air, realize that I have used that source (SEMI) for both positive and negative views. They no longer publish the Semi bookings side of the book-to-bill ratio (b2b) we found so important to guiding a bull view back in 2013 and reaffirming it in 2016. But they do provide ongoing analysis. The issue is in the interpretation of the data. Today’s happy-go-lucky analysts see the still-positive projected growth for 2018 and headlines like this and project positive outcomes well into the future. Others on the other hand, try to look around corners, whether toward positive or negative outcomes. Add the slowing Fab Equipment growth rate to the list of negatives that the charts and now, corporate guidance are starting to burp up. As a final thought, consider that no single analyst should ever put out a view for peoples’ consumption that is set in stone, to be defended come hell or high water. That only ends up hurting those who believe in the authority with which the analyst seems to speak. So if I am wrong and the sector is only providing a buying opportunity (as in 2014 and 2016) then so be it. Adjustments will be made. I am not marrying the view. But since last November when a goofy MSM headline called my attention to the subject, I have not seen much to dissuade a negative Semi Equipment view and hence, eventually a negative economic cycle view. Patience and perspective, as always.